We’ve been following the Sonder story quite closely for almost two years now. 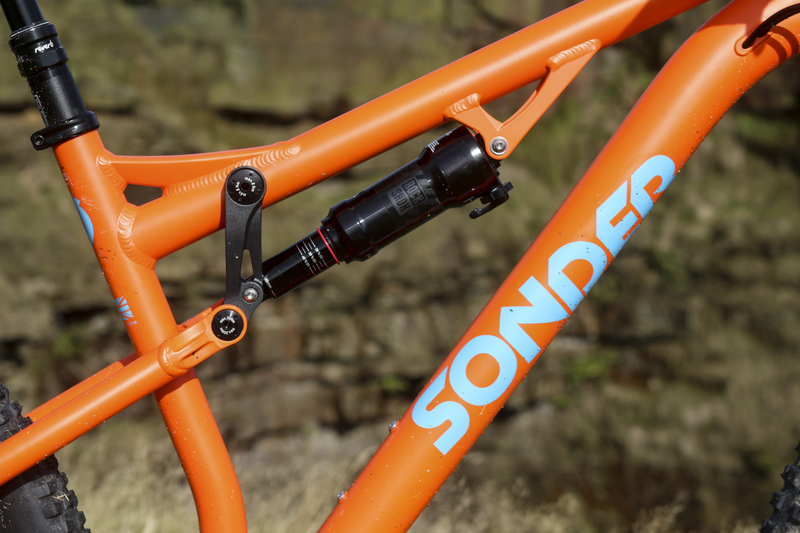 Sprouting out of the Alpkit tree as a new UK-focussed bike brand, Sonder Bikes launched its original alloy Transmitter hardtail back at the 2016 London Bike Show. 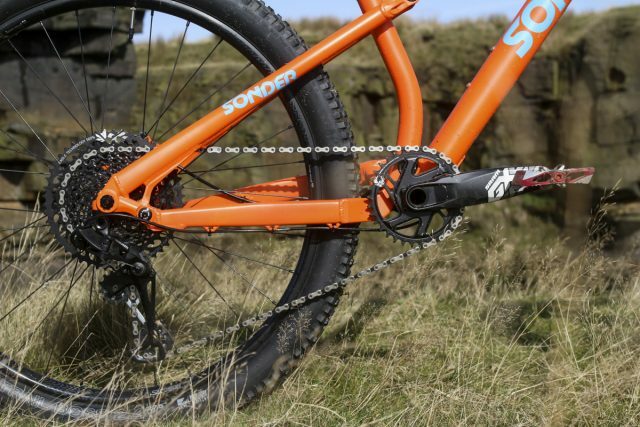 With a tough alloy frame, kicked back trail geometry and very sharp pricing thanks to its consumer-direct sales model, the Sonder Transmitter captured the attention of many, and even earned itself a nomination in last year’s Singletrack Reader Awards for Best Bike Under £1000. Since then, things have been cranking along for Sonder. 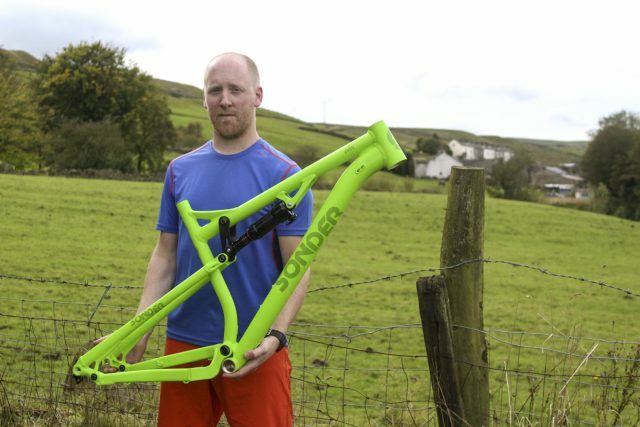 And so Neil Sutton, Sonder’s head honcho/bike designer/tester/bike builder/customer service man, has been very busy. He’s designed a new generation alloy Transmitter, and earlier this year, rolled out a carbon fibre Transmitter – a bike we currently have on test (check out the detailed First Look article here). There’s even been some news on the drop-bar side of things, with Neil having designed a new carbon fibre disc brake road bike called the Colibri (check it out on Grit.cx here if you’re into that sort of thing…). While all of that’s been going on however, Neil has had something else up his sleeve. Something with a little more squish. 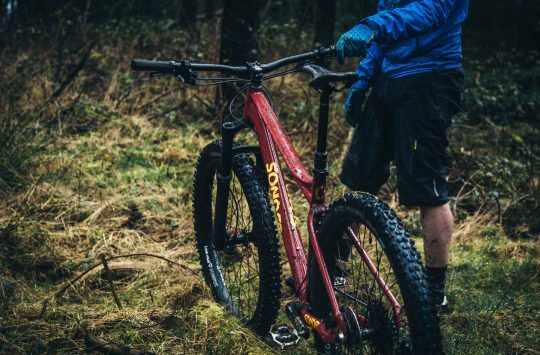 While Sonder’s off-road range has largely been of the rigid-framed variety up until now, it would appear that that’s about to change with the all-new Evol full suspension trail bike. The Evol is the first full suspension mountain bike to come from UK brand, Sonder Bikes. It’s still a Sonder, but this one has a rear shock attached to it. Sonder doesn’t build race bikes. 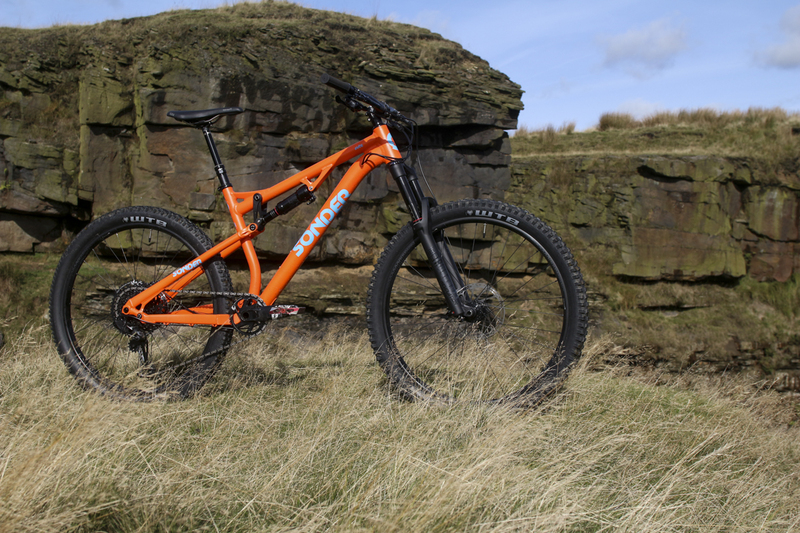 Instead, the Evol is a tough, 27.5in-wheeled, 140mm travel, fun-mobile. 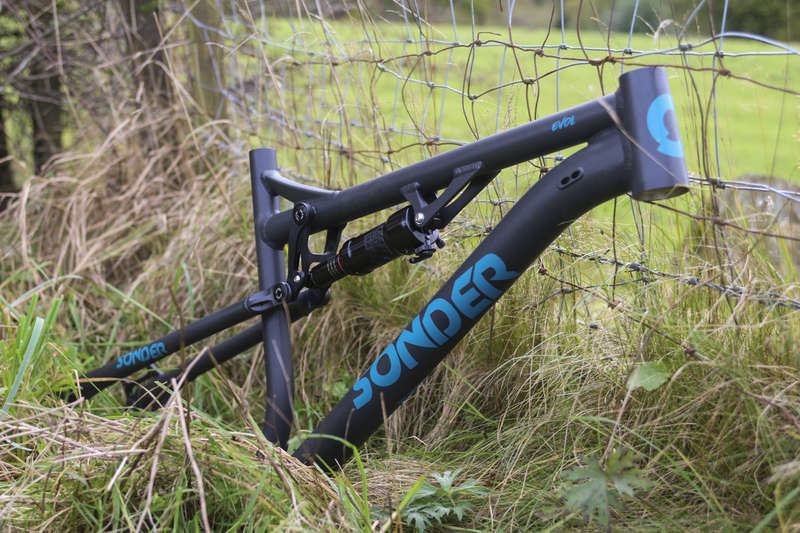 The new Sonder Evol arrives on the scene after 18 months worth of prototyping and testing. The model you’re looking at here is the third iteration of the design process, though not a whole lot has changed since the first prototype, aside from the back end being shortened a touch and the bottom bracket being lowered too. Otherwise Neil has been pretty happy with the frame design, suspension and geometry he originally settled on. The production versions are due to arrive before the end of November, and it’ll be available as both a frameset and as a complete bike. 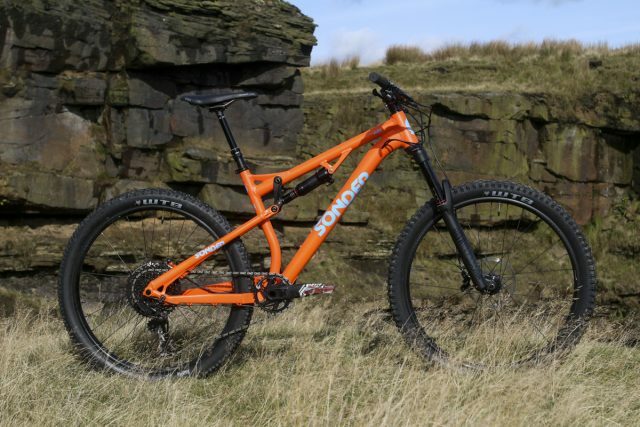 Pricing is still to be confirmed, though Neil tells us the Evol frameset will sell for £899 with a RockShox Deluxe RT rear shock, while complete bikes will start at £1599 – which is insanely good value for money! Prior to the Evol becoming available to the public, Neil wanted to visit us at Singletrack Towers to show us his new bike. This is the first time the Evol has been shown to the public, and so we took the opportunity to film a video with Neil, which you can watch in the video above. We were also able to swing a leg over a pre-production version of the Evol, and you’ll be able to read the first ride report very soon. 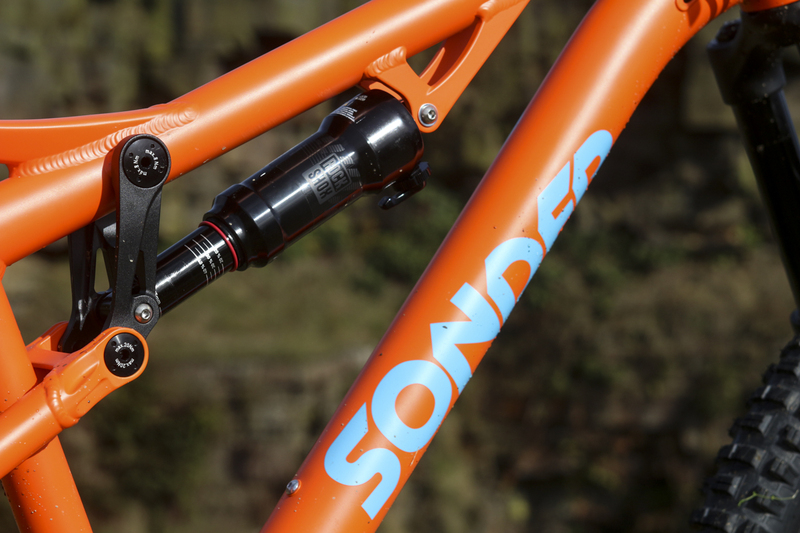 In the meantime, lets take a closer look at some of the details found on Sonder’s brand new full suspension trail bike. 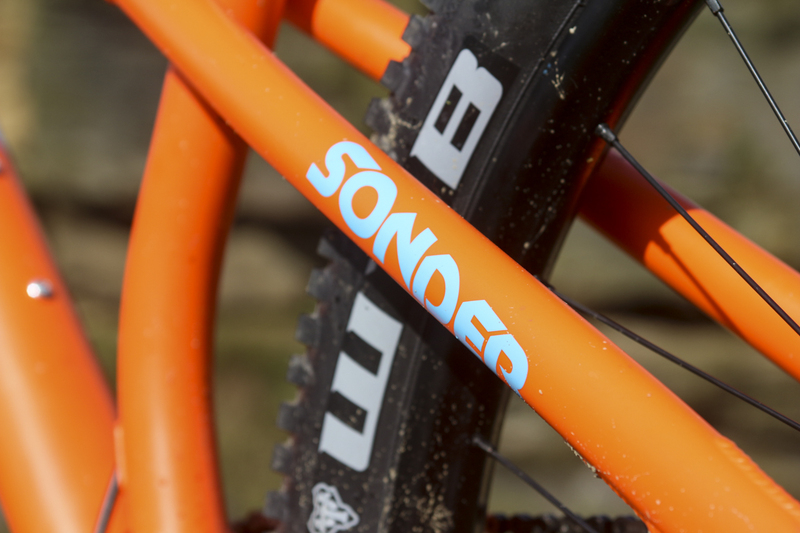 Sonder chose alloy tubing and a proven four-bar suspension design to build the Evol around. 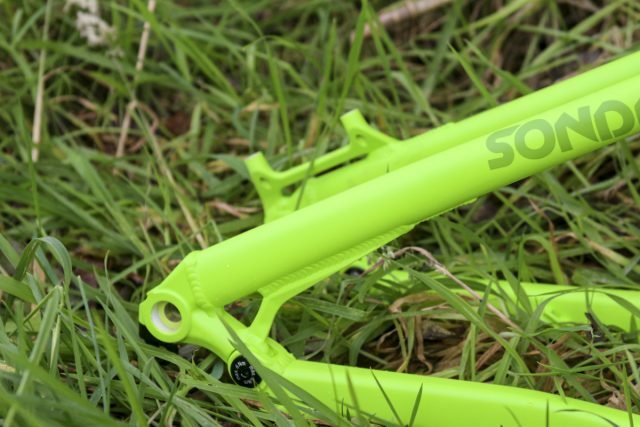 With a focus on durability and value for money, the Sonder Evol chooses alloy tubes to piece together its tough-looking frame. 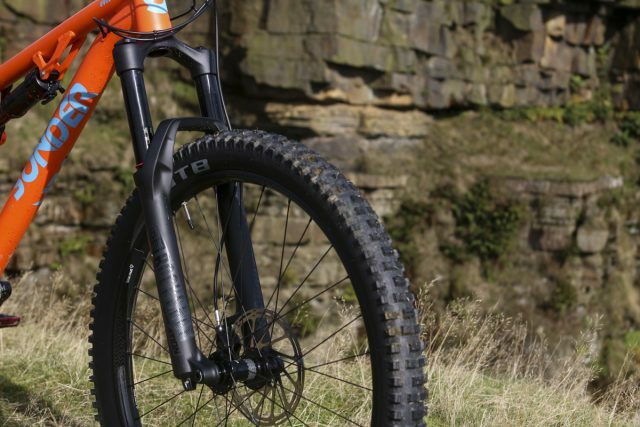 There’s a four-bar suspension design with 140mm of travel out back, and a top tube-mounted rear shock that’s driven by a black alloy rocker link. 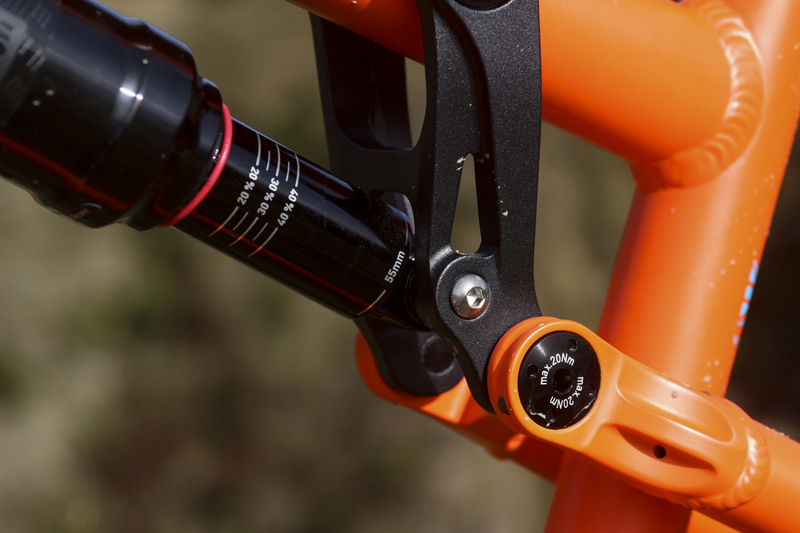 Pivot points feature alloy hardware and sealed bearings, and other practicalities include the ability to fit a water bottle inside the mainframe, and a threaded bottom bracket shell. 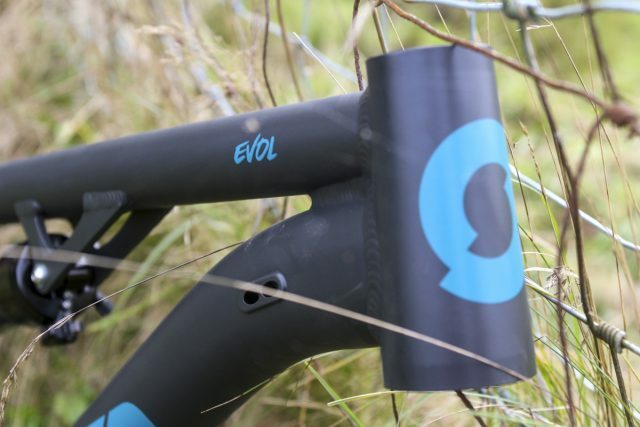 The Evol is designed for use with a 150mm travel fork, and geometry has been optimised around a compact 35mm long stem and 780mm wide handlebars. There’s room for up to 2.6in wide 27.5in tyres, and overall the Evol has been designed as a capable and fun do-it-all trail bike. 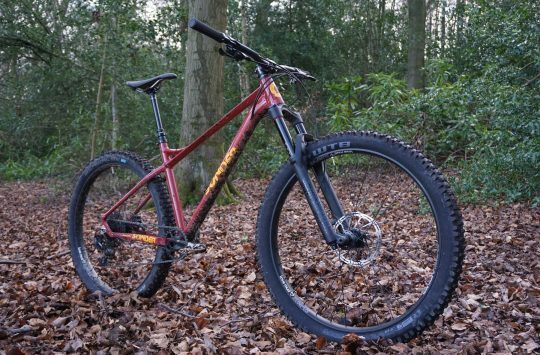 Neil says you could race it at an enduro event if you wanted to (it’s plenty strong to do so), but it’s mostly been built as a fun bike for weekend warriors. 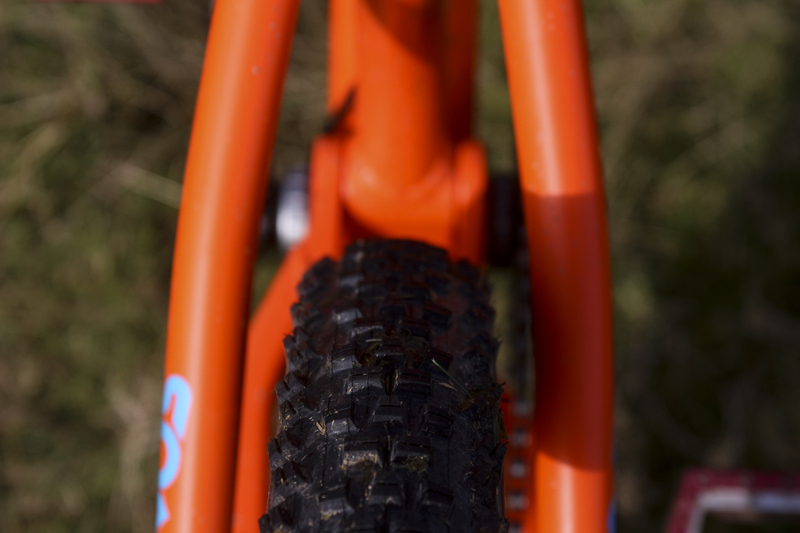 Chainstays are kept short, though there’s still loads of mud clearance and room for up to 27.5×2.6in tyres. 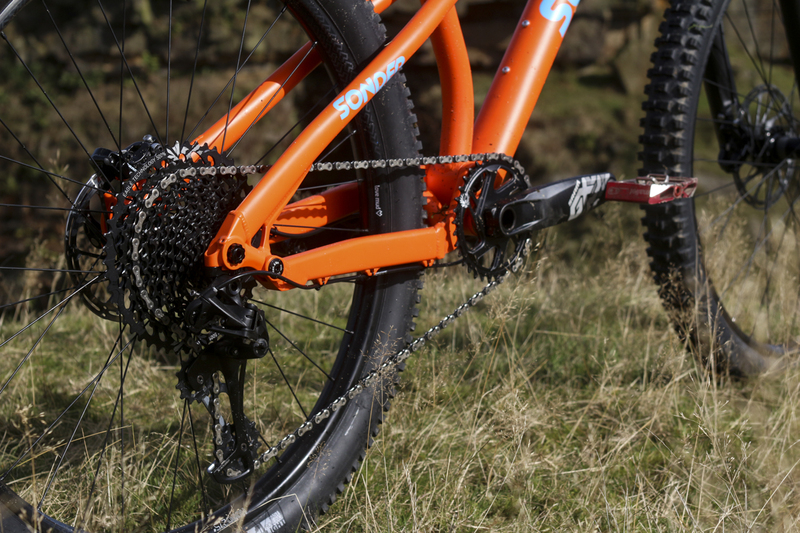 The Sonder Evol is optimised around a 1x chainring setup. Note the curve in the seat tube, which occurs lower down near the bottom bracket to provide plenty of insertion depth for the seat post. Spacing at the back end is Boost 148x12mm. 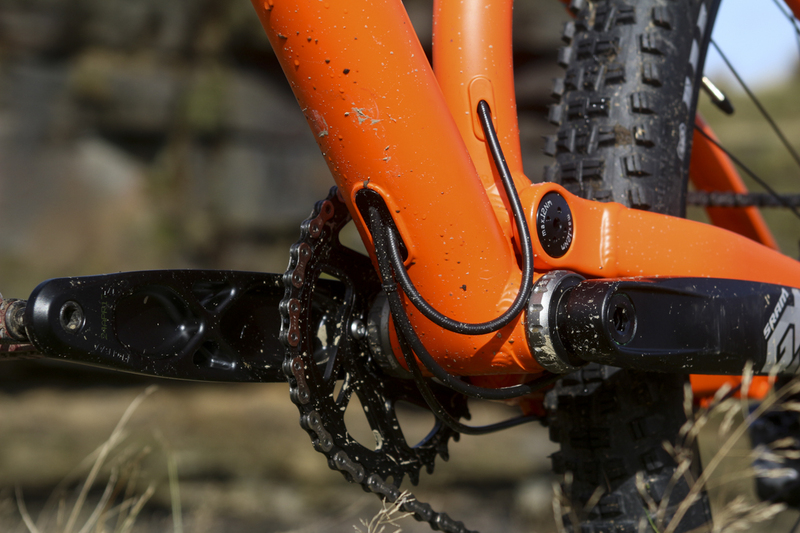 The rear mech hanger features a break-away bolt. 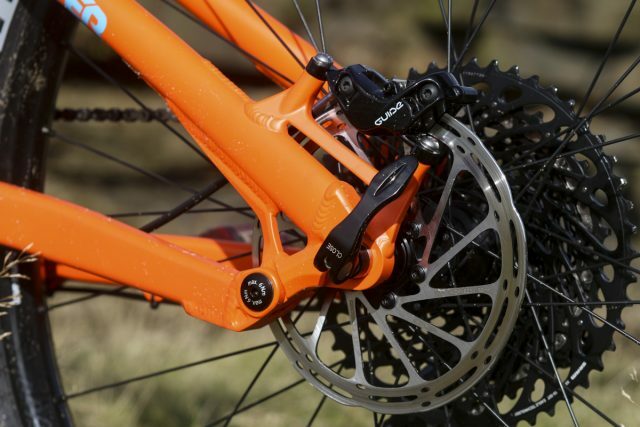 The rear derailleur hanger is similar to a Syntace X-12 system. 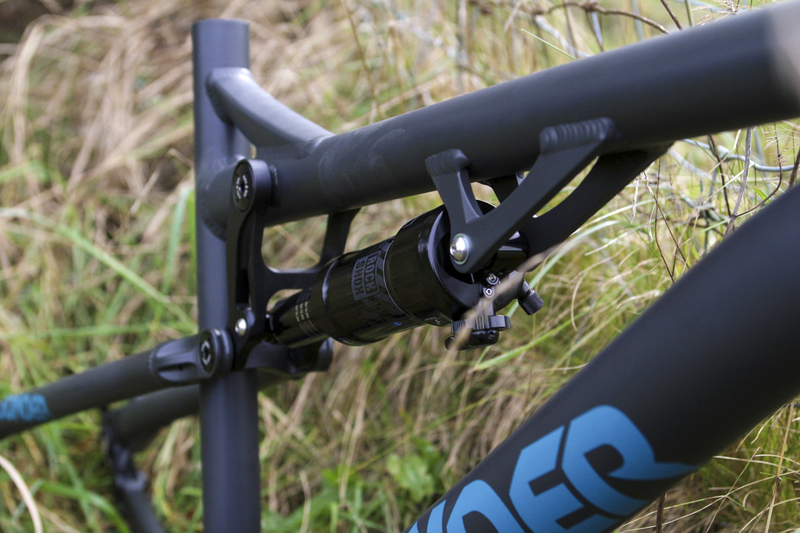 The hanger is a chunky piece of alloy that provides a stiff platform for shifting, and attaches to the frame via a hollow alloy bolt, and a single locating pin that helps to stop it from twisting in the dropout. 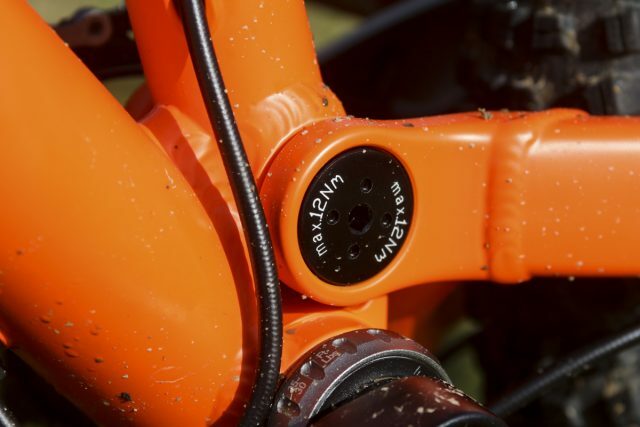 If you do snag a stick through the spokes or hit the rear derailleur on a rock, the hollow alloy mounting bolt is designed to break-away, ideally leaving the hanger, derailleur and frame intact in such a scenario. 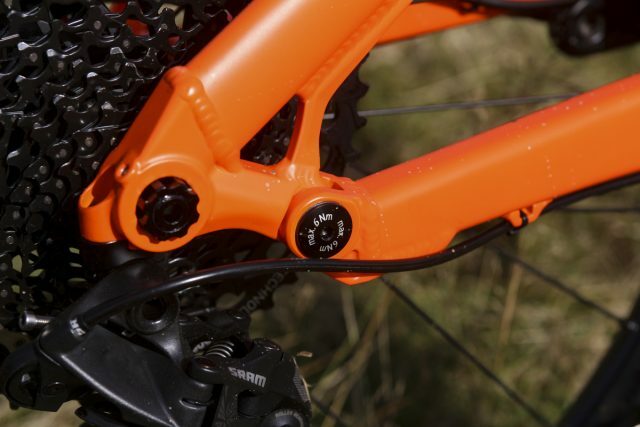 Neil apologised for the cheap quick-release lever on the Evol’s thru-axle. Production models will go with a much cleaner tooled bolt-up thru-axle. 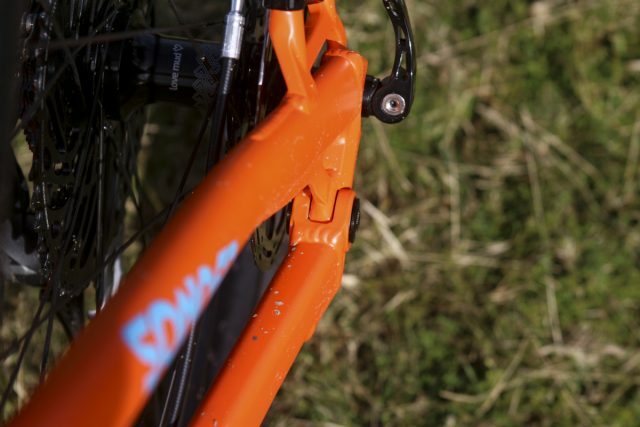 Sturdy clevis pivot at the rear of the chainstay. Compared to earlier prototypes, Neil has added a nice curve to both the seatstays and chainstays, which improves heel clearance when wearing chunky flat-pedal shoes. The bridge-less seatstays deliver oodles of mud clearance, and room for up to 2.6in wide tyres. There is a welded brace for the upper seatstay assembly, which joins them together for improved stiffness. Each pivot bolt is tightened with a 4mm or 5mm hex key. If you accidentally round them out though, there are additional holes machined into the pivot cap that allow you to use a pin spanner to remove them. Clever! Same design with the main pivot bolt. The bottom bracket shell and main pivot occupy the same chunky piece of forged alloy for added stiffness. A conventional threaded bottom bracket shell, and the large exit port for the rear mech, brake and dropper post lines. Tapered head tube up front, with an integrated headset that uses drop-in cartridge bearings. 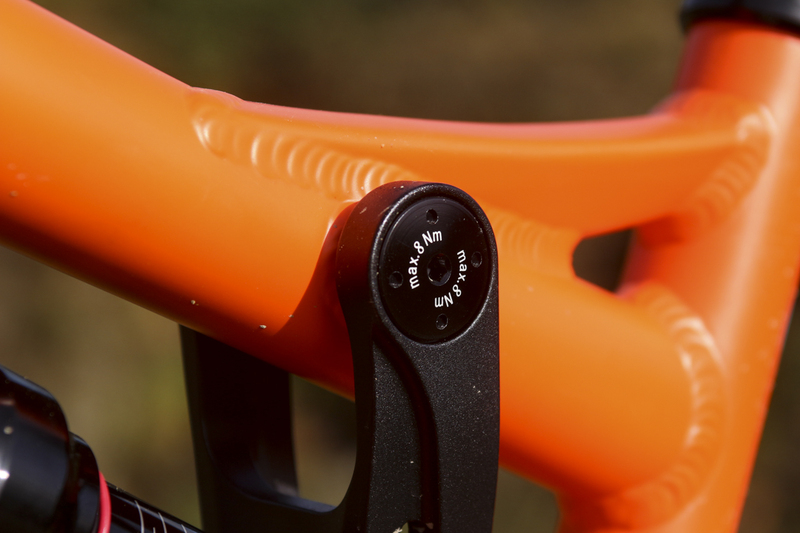 There are four frame sizes for the Evol, and each one is optimised around a 35mm long stem. 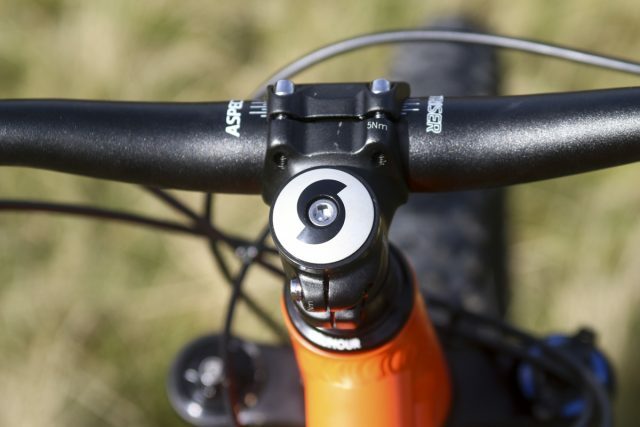 150mm travel fork up front delivers a stable 66° head angle. Complete bikes will kick off around the £1600 mark. For the shy types, there’s a classy-looking Slate colour option. After finishing off our ride at Lee Quarry, Neil casually pulled a box out of his car with a couple more frames inside. The Sonder Evol will of course be available as a frame-only for those who wish to build their own complete bike up, and pricing is going to be quite sharp. There will be four frame sizes starting with a Small and ending at an X-Large. Three colours are available, with the Orange, Slate and Lime Green colours all electing for a high quality matte finish that Neil says is very durable. This colour here is the understated Slate finish, complete with blue highlights. Tapered headtube with internal routing ports just behind it on the downtube. A RockShox Monarch RT shock will come with each Evol frameset and complete bike. Sonder is contemplating a coil shock offering too. And the Lime Green finish for those who want something a little brighter! Boost 148x12mm dropouts and post mount brake tabs. 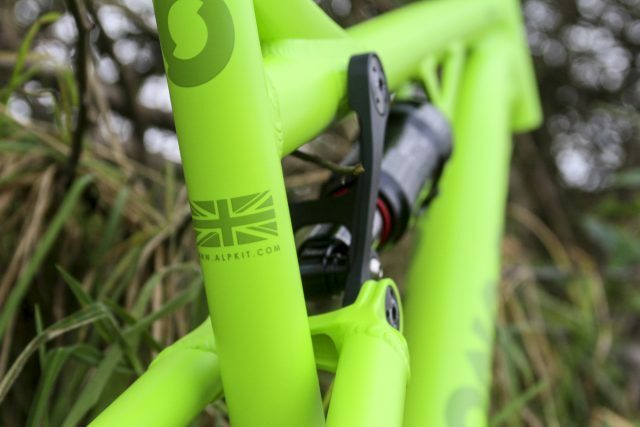 Designed in the UK by Sonder Bikes of the Alpkit family. The man himself; Neil Sutton of Sonder Bikes. We’d love to hear what you guys think of the new Sonder Evol! And if you have any questions about the bike, submit them in the comments section below and either we’ll endeavour to answer them for you, or we’ll get Neil to chime in with his input. 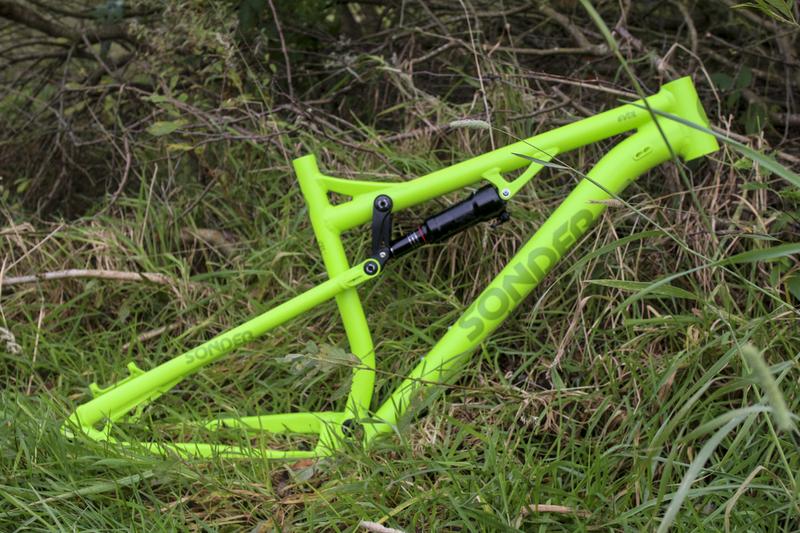 Otherwise stay tuned for the first ride report of the all-new Evol from Sonder Bikes! Looks good and prices appear unbeatable. Offering as a frame only is also a good move, very few manufacturers seem to be doing that nowadays. Yep – where’s the 29er? If true that’s bloody good value I was expecting the frame to be that price, Just shows how much I have become softened to the mega bucks pricing of some kit!! If the frame only is about a grand, £600 is not going to get you much in the way of kit. I’ll watch with interest. 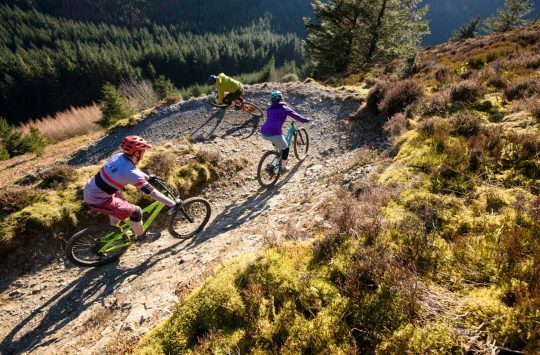 I spoke to Neil at Alpkit’s Big ShakeOut festival and he said the pricing and specs were probably going to resemble that of the Transmitter Carbon. I’m very taken by the green colouring! @asbrooks & @sboardman – that is correct! 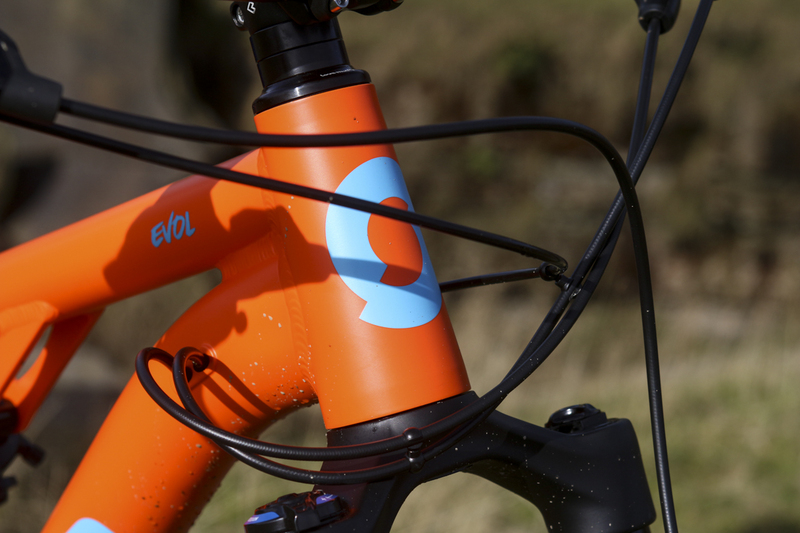 The build kits will be very similar between the Evol and Transmitter Carbon. 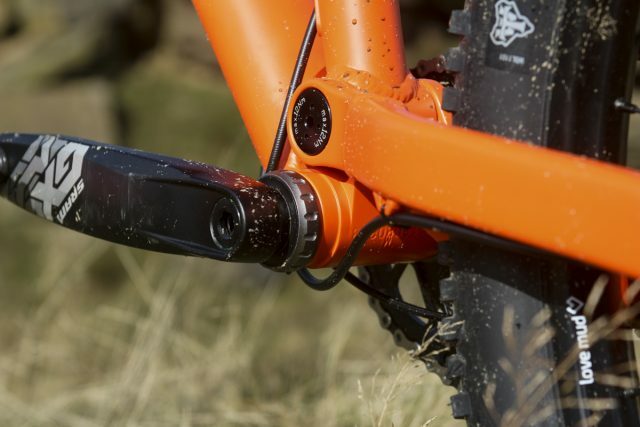 That means the entry-level Sonder Evol will feature a RockShox Recon fork, SRAM NX 1×11 drivetrain, SRAM Level brakes, Love Mud Rumpus wheels, and WTB tyres. And of course, a RockShox Deluxe RT rear shock. 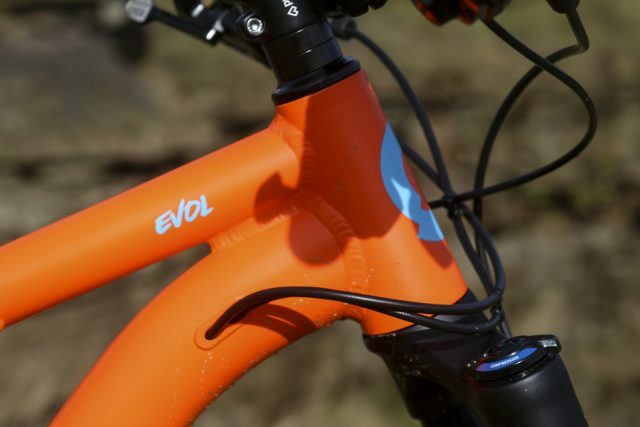 FYI; our first ride review will be landing on the website tomorrow (Sunday 7th), so stay tuned for more information on how the new Evol performs on the trail! 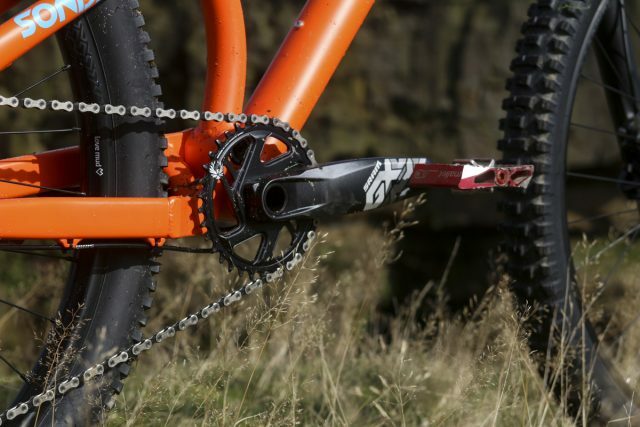 I’ve been eyeing up the Whyte t130, It looks very similar with a bit more travel and tyre clearance. I do like the look of it. Any info on geometry for the different sizes? In answer to your question, we don’t have full geometry details yet, but the reach measurements will be: 415mm (Small), 435mm (Medium), 455mm (Large), and 475mm (X-Large). Seat tubes have been kept as short as possible to accommodate 150mm dropper posts where possible, or longer on the bigger frames. Some of that cable routing looks a bit tight, was it really necessary to go fully internal routing on a simple do-it-all bike?